Tomatoes tomatoes tomatoes tomatoes tomatoes. I'm loving all the colorful late summer heirloom tomatoes on display at the farmers market. I fill a bag with one of each color and leave them to ripen on the windowsill throughout the week. 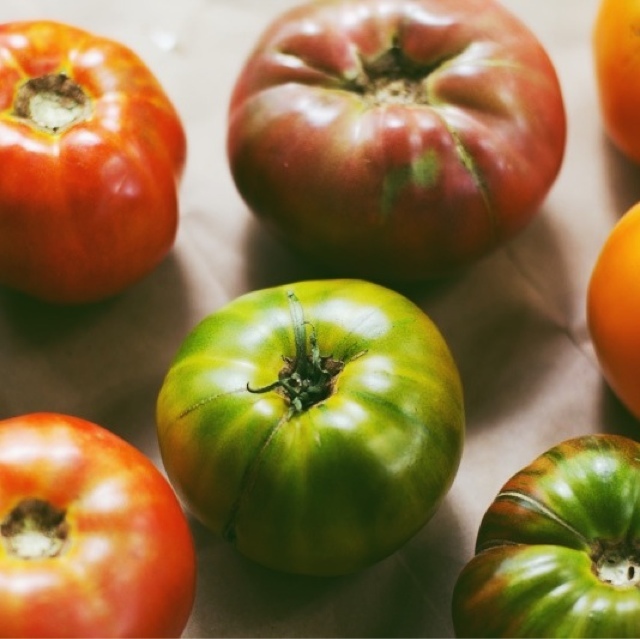 They are so much more flavorful than those hard little pale red tomatoes you can buy at the grocery store year round. I hardly think they should be allowed to share the same name. These tomatoes are just so good. Slice tomato into thick slices. Sprinkle with sea salt and freshly ground black pepper. Eat with a knife and fork. Or maybe just your hands. Garden Tomato Salad: Slice tomato into thick slices. Arrange in a single layer on your plate and drizzle with olive oil and balsamic vinegar. Top with freshly torn basil leaves and grated parmesan cheese. B.L.A.T. (bacon lettuce avocado tomato): My spin on the classic BLT. Stack your toasted bread with mashed avocado, bacon, lettuce and tomato. Caprese: An open faced sandwich, drizzle a toasty slice of bread with olive oil and sprinkle with sea salt. Top with a tomato slices, mozzarella cheese and fresh basil leaves. Pesto & Tomato Flatbread: Roll your pizza dough extra thin onto a greased rectangular, rimmed baking sheet. Spread a generous amount of basil pesto over the dough. Top with thickly sliced tomatoes. Bake at 400 degrees for 10 to 15 minutes. Remove from oven and sprinkle with freshly grated Parmesan cheese. If I think of more ways to enjoy the last of all of these summer tomatoes I'll post them here. The Squash Soup Experiment Continues!